Five years ago James Guest did the public a service by openly displaying his staggering ignorance of these subjects in an article he wrote for Quadrant in which he attacked Steve Kates for rightly taking issue with the Labor Government’s reckless spending policy to counter the recession. (One can read Kates’ tepid response here). Nobody has much idea what all those multiples of $900 handed out before Christmas were spent on or, if saved, what they will be spent on later this year or next. We can be very sure that it wouldn’t pass the cost-benefit test that Kates rightly wants to apply to the national broadband plan. But there is not the slightest reason to suppose that it has harmed the economy or will one day be proved to have done so. Essentially it is a redistribution of income. It is a budgetary matter. Some people, including many recipients of today’s handouts, will pay a little more tax in later years, or suffer a little from the RBA allowing government a little more inflation to make discharge of debt easier. This quote reveals the true extent of Guest’s complete ignorance of sound economic theory. What is missing from his counter attack is any understanding of the vitally important fact that the economy has both a capital structure and a relative price structure. As the Austrian school of economics points out, any government policy that promotes consumption must skew the price structure in favour of the lower stages of production. The effect of this process would be to retard the structure’s expansion — keeping living standards lower than they would otherwise be — or even shorten it in absolute terms thereby actually cutting the standard living 1. The view that one can separate budgets from the so-called “real economy” is pure hogwash. Budgets must always influence spending and therefore the pattern of production. It would be asinine to argue otherwise. It follows that if a budget succeeds in promoting consumption this must be at the expense of economic growth. This is because growth is in fact forgone consumption. To contest this fact is to argue that the economy is like a magic pudding. components of a fiscal stimulus package are costs to the federal budget; but to the extent that they put otherwise unemployed labor and idle industrial capacity to work, they do not impoverish the economy3. that of a total of almost 14 million persons were without jobs at the peak of unemployment in March, 1933, 6½ million were from the durable goods industries, nearly 6 million were from the “service” industries, and only 1½ million were from the consumption goods industries. Investment activity, in a word, is the tail that wags the industrial dog4. Failure to grasp the fundamental fact that demand springs from production leads to the view that the problem of widespread persistent unemployment is one of insufficient demand. From this it follows that just about any government spending that puts people to work rather than keeping them on the dole “will be beneficial to the economy”. And this is exactly what Guest does argue, even though it is pure balderdash. One would expect a reasonably intelligent person to ask why an unemployment problem should last “for the next few years”. Not our clever Mr Guest. Although Roosevelt implemented massive public works programs to counter the depression Australia still recovered faster than the US despite the fact that the Australian government cut spending while Hoover and Roosevelt increased it. 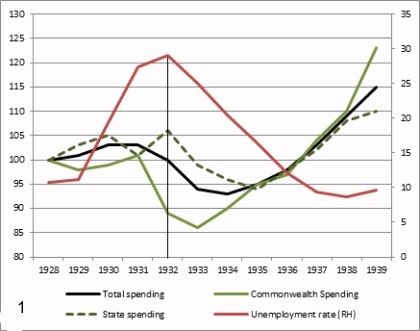 Chart 1 clearly shows that after Australian unemployment peaked in 1931 it then began to fall in the face of government spending cuts. This completely refutes Guest’s mercantilist view that government spending is a vital ingredient in any policy designed to put people back to work. Nevertheless, more evidence is needed and Chart 2 provides it. We can see from the chart that the remarkably rapid recovery in Australian manufacturing was due to a swift and continuous fall in the real factory wage5. So allow me to make this so simple that even James Guest can grasp it. As long as there is sufficient land and capital to employ people the problem of persistent mass unemployment would not emerge in a free market. However, if the cost of labour is raised above the value of its marginal product then unemployment will become a problem. Moreover, the larger the gap between the marginal value of the product and the gross wage (the total cost of hiring labour) the higher will be the level of unemployment. This fact was demonstrated by chart 2. We really need to emphasise the point that marginal productivity theory tells us that raising wage rates (gross wage rates) above the value of the worker’s marginal product will create unemployment. From this we make the obvious deduction that lowering these rates relative to the value of the product should cause unemployment to fall. We can clearly see this effect at work in chart 2. Now the real wage in Australian manufacturing for full-time labour in 1927-28 equalled 100. In 1930-31 it was still 100. For 1936-37 it was 99. During this period it never fell below 986. Once the real factory wage began to fall relative to the value of the product, unemployment also began to fall. Therefore, reducing the real factory wage rate relative to the value of the factory product increased the demand for labour. There is nothing new here. In the late 1920s Professor C. Benham produced similar results for Queensland. He constructed tables showing the relationship between wages, production and unemployment in Queensland for the period 1916 to 19247. Despite Guest’s assertion that Roosevelt-like spending on “school libraries” and increased grants “to first home owners” has worthwhile advantages the lesson of the 1930s clearly demonstrate otherwise. James Guest can appeal to Solow8 all he likes, the fact remains that the Keynesians have been proved completely wrong about the Great Depression. The Austrian school and those sneered at as old fashioned economists warned that concentrating on consumption would have dire consequences. What was needed, they pointed out, was a revival in the capital goods industries as shown by the following table. The consumer goods production index in 1929 stood at 100. By 1932 it had fallen to 70, rising to 77 in 1933 after which it continued to rise. Bad as these figures are they are dwarfed by what happened to the capital goods industries where production dived from 100 in 1929 to 32 in 1932, rising to 38 in 19339. I should add that during this catastrophic contraction real hourly wage rates continued to rise even as prices fell. What a country wants to make it richer, is never consumption, but production. Where there is the latter, we may be “sure that” there is no want of the former10. The problem was not lack of consumption but lack of production. Once you swallow the demand deficiency fallacy then there is no end of economic miracles that an accommodating state can conjure up. Hence Guest smugly tells us that by funding the insulation of houses this will reduce heating and cooling bills and “help offset some of the costs that result from Australia agreeing to reduce CO2 emissions”. (The brilliant Mr Guest also bought in to the man-made global warming con. Incidentally, Australians didn’t agree to any of this warmist and energy nonsense: The self-righteous likes of Turnbull and Guest imposed it on them). Clearly it never occurred to Guest that if people felt that they would receive a net financial benefit from insulating their homes they would have done so without a government cheque. If the money came out of a surplus the effect is basically no different from the Reserve Bank printing the equivalent amount of dollars and distributing them to a lucky few. This would be a one-off effect with no redeeming features. If it comes from taxes it ought to be clear — even to an economic illiterate like Guest — that the effect is to change the pattern of consumer spending while doing nothing to increase real aggregate demand. Guest’s economic illiteracy also shines through with his asinine opinion that taking money from Joe to help offset Bill’s rising energy bills will raise the demand for labour and increase government revenue. (Bastiat must be spinning in his grave). It would never occur to a James Guest that this kind of fallacious thinking amounts to a policy of making us all better off by taking in each other’s washing. In plain English, Mr Guest, if Joe is going to subsidise Bill who the devil is going to subsidises Joe? Furthermore, what the hell do politicians think they are doing in driving down the standard of living in order to please a bunch of lying green fanatics? And why doesn’t this bother Guest? Is it because he is filthy rich and knows he doesn’t have to worry about electricity bills? The oh-so self-satisfied Mr Guest once said of Greg Barnes that he “writes rubbish about something concerning which he has more opinions than knowledge”. May I humbly suggest that James Guest take his own advice and just shut up about economics. Note: It’s strange but true that Australia’s free market economists steadfastly refuse to acknowledge the vitally important fact that in Australia the demand for factory labour during the great depression rapidly increased once the real factory wage started falling. The same thing happened in the US, but to a much lesser degree. Rather than focus on wage rates the right obstinately insists on talking about government spending. For instance, Julie Novak and Professor Sinclair Davidson made the egregious error that it was the reduction in spending that sparked the recovery. They completely ignored the role that money and wage rates played during the depression. Moreover, if this pair were acquainted with the literature they would have known that C. B. Schedvin gave a post-Keynesian answer11 to their argument on spending and jobs. When it comes to economic history these economists are worse than useless. And they are no great shakes on the history of economic thought either. Their treatment of the classical school and the trade cycle is grossly incompetent. Furthermore, I think it’s plain to see that Abbott’s failures can be traced back to the right’s dismal failure to make a compelling case for the free market. 1Friedrich von Hayek, The Paradox of Savings in Profits, Interest and Investment, Augustus M. Kelley Publishers, 1975, pp. 255-263 . 2W. H. Hutt, The Theory of Idle Resources, Liberty Press, 1975. There is also his critique The Keynesian Episode: A Reassessment, LibertyPress, 1979). 3Robert M. Solow, How to Understand the Disaster, the New York Review of Books. Solow is an unrepentant Keynesian whose grasp of the economic crisis of 2008 is as horribly wrong as his understanding of the cause of the Great Depression and factors that prolonged it. Even five miserable years of Keynesian failure has not shaken this man’s cultist devotion to Keynes. As for James Guest, Australians deserve better than politicians who mindlessly parrot what they read without giving it a moment’s thought. I suspect that even a moment of thought would have been too painful for Mr Guest. 4C. A. Phillips, T. F. McManus and R. W. Nelson, Banking and the Business Cycle, Macmillan and Company 1937, p. 235. 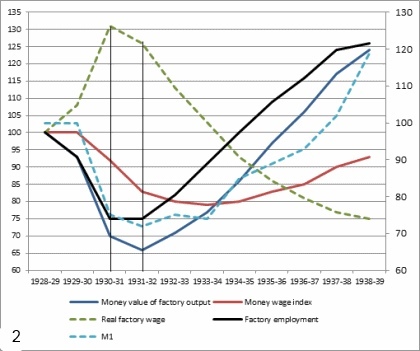 5The real factory wage is the ratio of the money wage rate to the total money value of factory output. 6C. B. Schedvin, Australia and the Great Depression, Sydney University Press, 1988, p. 350. 7The Prosperity of Australia, P. S. King & Son, LTD, Orchard House, Westminster, p, 210-11 1928. 8What one might call the Solovian approach is completely rejected by the Austrian school. For Solow capital theories are either technocratic or descriptive. For Austrians capital is a heterogeneous structure with a time dimension. This approach allows the Austrians to explain the nature of the boom-bust-cycle and why the higher stages of production are always the first to go into recession and suffer the greatest falls in output. 9Frederick C. Mills, Prices in Recession and Recovery, The National Bureau of Economic Research, Inc., New York, 1936, p. 418. 10John Stuart Mill, Essays on Economics and Society 1824—1845, Liberty Fund, 2006, p. 263). One could argue that Malthus was the exception. However, after the economy recovered from the severe economic contraction of 1825—despite Malthus’ belief that stagnation was now the order of the day — he muted his views somewhat. I suppose he thought this was better than challenging reality. 11Australia and the Great Depression, Sydney University Press, 1988, p. 252. About time. I thought you’d been hospitalised. Very nearly. I had a slight accident. I’m managing to get around now. If our bloody useless right wing wrote like this they would have had those bloody leftists on the run years ago. I was taken aback by the sheer ferocity of Gerry’s attack on Guest. I thought Gerry had gone overboard on this one. After thinking about it for a while I changed my mind. Considering the seriousness of the subject and Guest’s approach I decided that the bloke deserved a good kicking in the balls. I think kates should have got a good bullocking as well for the soft way he treated Guest. boy oh boy, I love gerry’s take no prisoners approach. This is just what we need. Margo hit the nail on the head about “smouldering rubble”. No way is blowhard Guest going to respond to this. The really great thing about this site is its extensive use of history to support its arguments. You don’t find this at catallaxy or the Institute of Public Affairs. I didn’t bother with the Kates link until I read margo’s comment. She is right about Gerry not being hard enough on Kates. His reply to Guest is pathetic. Whereas Gerry brought howitzers and flame throwers to the fight Kates brought a feather duster. Maybe he thought he could tickle guest to death. “tickle guest to death”. that just broke me up. Good one Biggles. You are living up to your name. I think we should start calling kates “Dr. Tickles”. I think we have all got Kates’ number. Gerry’s end comment on the right-wing was penetrating. It also made me realise how stupid I had been because I failed to notice that since gerry’s posts on the great depression and spending went up Sinclair Davidson and Julie Novak have dropped the subject. They used to comment on these things frequently, until Gerry exposed their mistakes. The same with Kates and his trade cycle stuff and the classical economists. God blimey, what a bunch of dishonest wussies. Gerry has to be very careful. Now that Sinclair Davidson and his friends have labelled this blog a hate site and Gerard Jackson as a “hater” they might report him to the Equal Opportunity Commission or the Victorian equal opportunity and human rights commission for the vicious crime of exposing our right-wing’s errors and hurting Professor Davidson’s feelings. That was funny, Cooper. It made me think of those pompous statements sinclair Davidson has up at catallaxy where he says “it is dangerous to have unchallenged consensus opinions. “ Then he has, “Because the bastards shall not get away with it.” This is the same creep who called this blog a hate site and told people to ignore anything Gerry writes. Sarah, everyone here now knows that Davidson and his mates are like. You’re wasting your time if you think you will ever get an honest response from that lot. I don’t know if Sarah realises it but her comment about Davidson and Kates is really an accusation they are trying avoid embarrassment over their mistakes by preventing any debate on the Great Depression and the classical economists. At least you always learn something new from Gerry’s posts. You don’t seem get this amount of historical detail on other blogs. I think Nick nailed it. that lot really are trying to prevent any debate on spending and the great depression. firstly production emanates from demand not the other way round. Secondly Roosevelt had growth rates of almost 10%. Our recovery was much more tepid and came AFTER the massive devaluation. We had NEGATIVE growth following the silly budget of 1931. That budget set back recovery! Unemployment can be easily explained. real wages increased courtesy of deflation. Once inflation arrived at last courtesy of the devaluation real wages fell. Also monetary policy could then start to work as the liquidity trap was no longer with us. If classical economics worked then Bruning would be seen as the greatest German leader of all time. It was disastrous which even Hayek conceded and we got Hitler!! Come to think of it, Nick, you are right. I hadn’t fully thought out my ideas when I made that comment but now that I think about it you have got the gist of it—that’s exacly where my views lead and I am sticking to them. there’s nothing scholarly about the catallaxy crowd, that’s for sure. Gee, that nottrampis sure is a glutton for punishment and a pain. Why does Gerry bother with the guy? Frodo’s right, notrampis just keeps repeating the same old stuff, the bloke never really tries to prove Gerry wrong. Eddy and Frodo have got it wrong. Gerry is doing the right thing in allowing critics to have their say. Did he not say in an earlier post that he welcomed debate? I think he know just what he is doing. Then you are not reading. He was incorrect about the Recovery in the US and Australia in the 1930s and what occurred to Australia after the 31 budget. GDP fell it didn’t rise! Be careful everyone . Don’t just look for agreement. I don’t happen to agree with Gerry a lot but I do read him and put his articles in my Around the Traps because I find they are well worth reading even when you disagree with him. As usual, Homer, my response turned out to be longer than expected. I shall be posting it tomorrow. Think of it as an opening gambit followed in the very near future by several posts in which I shall elaborate on these points in far greater detail. Sorry about you going into hospital. I hope it is not serious and that you will be out soon. I spent a bit of time in hospital myself not too long ago. The staff were great but I certainly would not wish to repeat the experience.